With our baby due at the end of September, I am now starting to design and decorate the nursery. The room is almost finished in my head (predominantly white with colorful accents) but this doesn’t stop me from surfing the net for more inspiration. 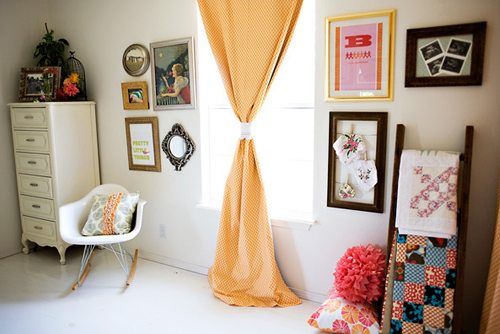 This beautiful nursery is decorated by Ashley for her baby daughter. She’s filled it with handmade gifts, keepsakes and reminders of family – a quilt sewn by an aunt, an art print designed by a sister, a mirror received as a wedding gift, antique handkerchiefs from a grandmother and great grandmother, a treasured photo of beloved grandparents – that will surround her daughter and welcome her into the family fold. 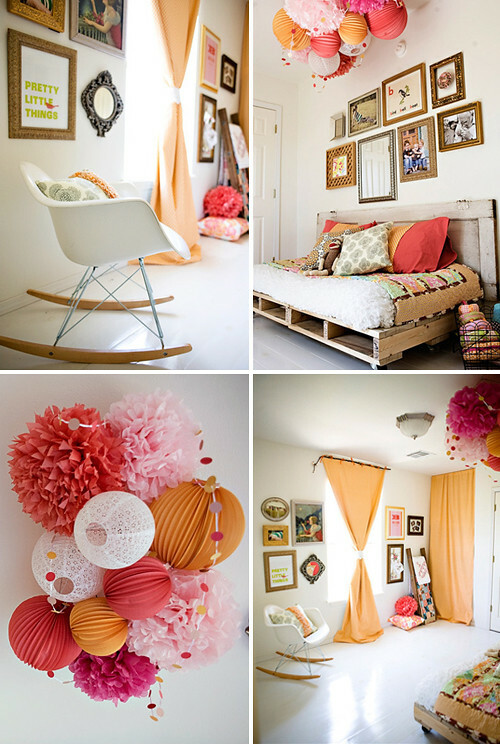 Lovely, The pink and orange are accented so well. This may just be the most wonderful nursery I’ve ever seen. So much charm and so inspiring. I adore the bed on skids with the door headboard. Swooning over here! !